Joan Leslie – A Real Top-Notcher – Dies At 90 – What Price Hollywood? It was announced today, that the beautiful and talented actress, Joan Leslie, passed away earlier this week at the age of 90. Joan Leslie has always been one of my favorite actresses – a real top-notcher, as my Grandpa Burke used to say. She was wildly popular with audiences in her day, but is not as well known outside of classic film circles, as some of her contemporaries are. She has always fascinated me – and she really had an amazing career. She started very young, and most of her major successes came before she was even 18 (even though she feels so much more mature – and even played older often than she really was). She was so popular during World War II, that she even played herself in “Hollywood Canteen” – as the ideal movie star that every soldier would want to win a date with. And I must admit, I’ve often felt that she wasn’t really acting in that part – just playing herself… bubbly, at-ease, talented, and very sweet. A true product of the studio system, Joan Leslie started her career working with some of the top talent at the time (her first part is actually an uncredited role in the Greta Garbo production of “Camille”). Her very first starring role was opposite Humphrey Bogart in “High Sierra”, and after that she followed up starring opposite the two Best Actor winners for 1941 and 1942 – Gary Cooper in “Sergeant York” and Jimmy Cagney in “Yankee Doodle Dandy”. She also danced with Fred Astaire in the very underrated “The Sky’s The Limit” (where she introduced the standard, “My Shining Hour”). She could really do it all – play light comedy, hold her own in heavy drama, dance and sing – she was the ultimate contract player. They pretty much could put her in anything and it would work – and that’s why I find her talent so incredible. She was very serviceable as a studio employee – they plugged her in wherever needed, and she even had the uncanny ability to take otherwise lame dialogue, and make it her own. She always just felt very at ease – and made it all look so effortless. That might be why she’s not as well known today despite her amazing career – sometimes workday actors like that can be taken for granted. Their ability so seamless, that we don’t really think they’re doing much of anything. And possibly even more interesting is that, when she fell in love and married a doctor (until his death in 2000), she eventually gave up her career to raise twin daughters – and resumed working on television only after they were grown and out of the house. If I had to say why I have always liked Joan Leslie in any film I’ve ever seen her in – it’s because no matter what she was doing, you felt that she was really having a lot of fun up there. Almost as if she was grateful just for the opportunity – and eager to make good to the audiences that were there to see her. And it’s fun to watch someone else having fun – it’s infectious. And for this, she brightened up many studio films she appeared in. And I will continue to enjoy watching her up on the screen every time TCM plays one of her films. You almost can’t help but smile. What a better way to to remember Joan Leslie than enjoying her on screen – check out the clip below, one of her best numbers, from “The Sky’s The Limit”. She more than holds her own with Fred Astaire. And the number ends with one of Astaire’s best lines – when asked by Joan where he learned to dance so well… Fred responds “Arthur Murray”. 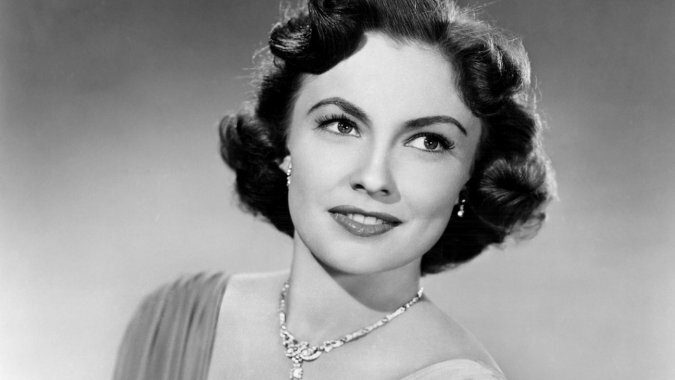 Joan Leslie, the dark-haired Hollywood ingenue who starred in High Sierra, Sergeant York, Yankee Doodle Dandy and The Sky’s the Limit — all before she turned 18 — has died. She was 90. Leslie, who often played the sweetheart or the wholesome girl next door on the big screen, died Oct. 12 in Los Angeles, her family announced. After signing with Warner Bros. at age 15, the Detroit native played the hobbled girl Velma in High Sierra (1941) opposite Humphrey Bogart and Ida Lupino, then was the love interest of Gary Cooper’s World War I hero in Sergeant York (1941). Her other films at Warners include the circus movie The Wagons Roll at Night (1941), also with Bogart; The Male Animal (1942), starring Henry Fonda and Olivia de Havilland; Hollywood Canteen (1944), in which she played herself opposite her older sister, Betty Brodel; Where Do We Go from Here? (1945), with Fred MacMurray; and the Busby Berkeley musical Cinderella Jones (1946), also starring Robert Alda. Looking for better parts, she took Warners to court to get out of her contract and in 1947 hooked up with Eagle-Lion Films and then Republic Pictures. Born Joan Brodel in Detroit on Jan. 26, 1925, she and her two older siblings performed in a singing and dancing vaudeville act called The Brodel Sisters. She also worked as a child model, and when her sister Betty signed with MGM, the family moved to Burbank. At age 11, Leslie landed an uncredited role in George Cukor’s Camille, starring Great Garbo and Robert Taylor. She then appeared in such films as Nancy Drew… Reporter (1939) and Two Thoroughbreds (1939) and had an uncredited role in Alfred Hitchcock’s Foreign Correspondent (1940) before she signed with Warners. Her first movie under her stage name was High Sierra. She made Repeat Performance (1947) at Republic, followed by such films as Born to Be Bad (1950), Man in the Saddle (1951) with Randolph Scott, Woman They Almost Lynched (1953), Jubilee Trail (1954) and The Revolt of Mamie Stover (1956). Leslie married obstetrician William Caldwell in 1950, had twin daughters in 1951 and slowed her career to concentrate on her family. In the 1970s, Leslie appeared on episodes of Police Story, Charlie’s Angels and The Incredible Hulk, and on a 1988 installment of Murder, She Wrote, she guest-starred opposite another 1940s starlet who starred opposite Cooper, Teresa Wright. A funeral mass will take place at 10 a.m. on Oct. 19 at Our Mother of Good Counsel Church in Los Angeles.